I have to tell you a funny little fact about my 9-year-old son, Tiger. He adores audiobooks. They are his absolute favorite things. Do you know what he does to get more listening time? He sets his alarm on the weekends and wakes up early just to lie in bed listening to his newest audiobook. I’ll be awake blogging in the early hours and I’ll hear the exciting stories floating softly down the hallway into our room. It makes my heart happy that he loves stories. He even asks for audiobooks for his birthday and Christmas. Yes, he loves them that much! But let me tell you another fact about Tiger – he has been a struggling reader. We’ve been working on reading skills daily for the past 4 years. He is making very slow, but steady progress. However, I worried about his reading skills. I also worried that he would hate reading because it was so hard for him. Through listening to audiobooks, the world of literature has finally been opened to him. He enjoys stories and his vocabulary and comprehension has increased exponentially. Audiobooks have been the catalyst for motivating him to learn to read. Do you have a struggling reader at your house? Then fill that child’s mind with audiobooks – great literature yes, but also fun books. Spark an interest in stories that will be carried over into reading lessons. Audiobooks can be one of the most valuable assets to your homeschool. Start adding audiobook time into your homeschool. You will be encouraged by the result! And if you’d like to get some new audiobooks for your kids, be sure to enter the giveaway at the bottom of this page! Need a list to help you get started? Here are Tiger’s current favorite audiobooks! Follow the story of all the unnamed fairy tale princes as they come together to save their kingdom. This is an entire series about Greek mythology full of monsters and adventure. Journey to Fablehaven – is the hidden refuge of mythical creatures. A boy dives in to a hole under a haunted house and finds himself in the Outskirts, a place between reality and imagination. What happens when you find a book that details how to become a wizard? One lonely girl has the chance to find out. Enjoy the island adventures of the Walker family. This one is considered a classic. Read the real story of Rumpelstiltskin in this fractured fairytale. A famous author creates a game where books and clues are scattered throughout the city. Then he is mysteriously attacked and two children must unravel the mystery behind his new game. This is a fun detective story with economics principles woven throughout. The stories of the Greek gods are retold with wit and sarcasm. For more audiobook ideas, be sure to read these two posts about our favorite audiobooks. There are lots of wonderful options! You can also listen to free audiobooks at Librivox. And if you have a struggling reader like I do, stop by this post where I list all the ways I helped Tiger on his journey to learn to read. I also encourage you to check out All About Learning Press. They create wonderful, hands-on curriculum for teaching reading and spelling. I can’t say enough wonderful things about these programs. They are the reason I have seen improvements in Tiger’s reading abilities. All About Learning has an entire resource library for struggling readers. You can find the resources by clicking on the banner below. Audiobooks are our favorite thing around here! Books my daughter would not have read on her own like the Little House series she will listen to for hours on audiobook. And with 4 kids seven and under,they are an essential part of our homeschool! Yes! Audiobooks are essential for large families. We love the Little House books too! So much fun to listen to. I have never even thought to look at iTunes for audiobooks. What rock have I been living under?! I always use Amazon or Overdrive with our library. Audiobooks are essential in my house and in the car. I have contemplated an Audible membership but wonder if it is worth it. Have you tried Audible? 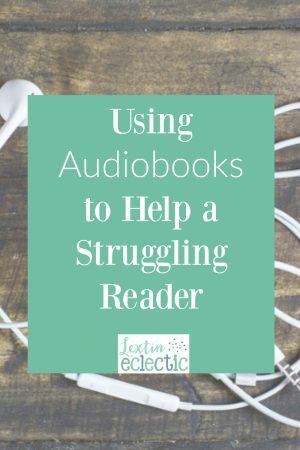 We are audible members and it’s been worth it for us because my kids listen to so many audiobooks. But I use iTunes also. I have an audiobook addiction!! BTW, a current favorite in my house is the Wing and Claw series by Linda Sue Park. I don’t think I would do it justice if I read it aloud to my children. The voice over is fabulous. I haven’t heard of that one! I’ll have to check that out. My kindergartener LOVED “Rump”, “Jack”, AND “Red.” We also loved “The Dragon’s Guide to the Care and Feeding of Humans.” Some others included: “The Rats of Nihm,” “Flora and Ulysses: The Illuminated Adventures,” and “The One and Only Ivan.” She also loved “The Penderwick Sisters,” “Five Children and It,” and all of the Tinkerbell Fairy Series (chapter) books. We’re avid users of audiobooks. Audible has many children’s audiobooks available too. Oh we’ve listened to several of those! What great choices!! Oh I haven’t heard of that series by Chuck Black! We’ll have to try those! We haven’t listened to many audio books yet, but I got some great ideas from this post and the comments, thanks! My nephew loves Diary of a Wimpy Kid! Harry Potter series – I love them just as much!